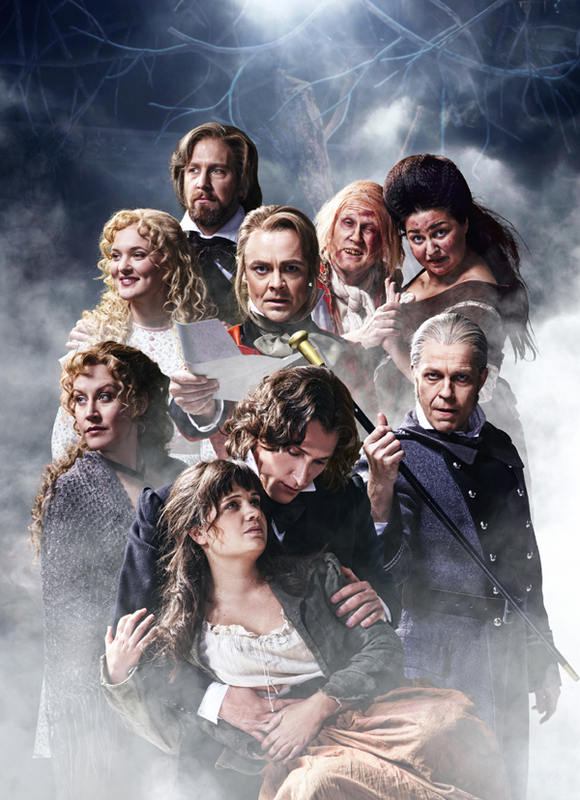 Åbo Svenska Teater's Les Misérables continues next winter, for a month at least. Real story about the pictured event to follow later. I just had to get the happy news out of my system before even trying to fall asleep tonight. Voikkuinen was sneaky enough to tag me with one of these eight facts things! 1. Thank the person who gave you this tag - thaaaaaank youuuuu Voikkuinen! 2. Pass the tag to eight bloggers - you know what, I don't think so. I'm afraid I don't read too many blogs whose writers would care about this challenge. 3. Tell them about this tag - yeah. 4. Tell eight random things about yourself - now this is the fun part! Okay! Go! Eight random MUSICAL things about Siiri - I want to have some order here, this is a musical blog after all! 1. If I were to work in a theatre - and I wish I will, one day - I think I'd rather work offstage than onstage. I briefly wanted to be an actress when I was a kid, but that dream soon went the same way as my previous dreams of being a runner in the Olympics and selling yarn in a yarn shop. Though I admit I suffer from the feeling I bet every other musical fan recognises - that my life won't be really complete before I get to be a part the One Day More march in Les Mis. 2. Grease was the first musical I ever liked. I was ten or eleven years old when I first saw it. My mother screamed to me that there's something fun on TV and I ran upstairs. She started taping the film from the point when Danny and Sandy meet each other again in the school sports event, and the first tape ran out of space in the middle - so I had about 5/6 of Grease on two separate VHS's (remember those wacky things?). I loved it beyond belief and could watch it twice the same day without getting bored in the least. Grease was also my first musical CD and the first DVD I owned. 3. Being such a huge musical fan as I am, I have an oddly small number of favourite actors and actresses. I blame the fact that I've been an obsessive musical freak for less than three years. A year plus some being the runtime of an average Finnish musical, I haven't seen too many actors in more than one role so far. I don't want to name favourites based on one performance only. 4. Les Misérables is my favourite musical, I love it to bits and still cringe every time I have to watch through the horror of Gavroche dying, but it has made me cry only twice. First time was by the end of the first time I ever saw the show, in West End. The reprise of Do You Hear the People Sing was too beautiful to hear - and not to cry! The second time was this summer in West End when the Overture begun. I don't know what hit me, but I started sobbing pretty grandiosely. I calmed down pretty quickly, though. 5. The Book of Mormon is the musical I'd most love to see at the moment. Other ones I'd love to see live but haven't had the chance to, yet, are Notre Dame de Paris, Elisabeth, Sweeney Todd, Hairspray, Avenue Q and The Hunchback of Notre Dame (so many good musicals about this story, yet none to be seen by me!). Among others. 6. I've 55 musical cast recordings in my collection. They're of 30 different shows and feature seven different languages. Ironically enough, one of these languages is not Finnish, and German - which I don't speak at all - is the most popular language in my collection right after English. My biggest number of CDs per show owned is, of course, Les Misérables, with eleven cast recordings and counting. My iTunes has 2,5 days of showtunes. 7. I've seen musicals live 45 times. I've seen 25 different shows live. The show I've seen the most times is, of coure, Les Misérables, with nine times and counting, two productions seen (by the end of this year, the estimated numbers are 12 times and three different productions). Out of all the musicals I've seen, the first was Mamma Mia! 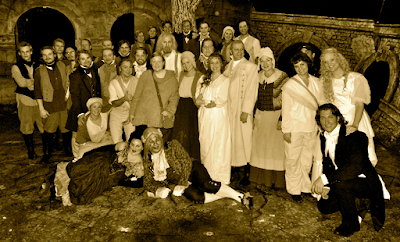 's world tour when it stopped at Helsinki, and the latest was Les Misérables, in Åbo Svenska Teater yesterday evening. 8. To me, sungthrough musicals are the best musicals. I think I should stop calling this thing a musical blog altogether and instead call it a blog about all things Les Mis... But I'm on a roll now! To balance out all the negativity in the previous entry, let me present you with some of my favourite things about Åbo Svenska Teater's Les Misérables, in no particular order. I guess my goal is that if someone, sometime in the future, for whatever reason, wants to stage an exact replica of the ÅST Les Mis, they don't have to go digging around the theatre's archives for the director's notes or rehearsal videos... My blog will tell them everything they need to know. Some Superfluous Opinions - because I know reading me ramble is a bit more interesting than watching grass grow! In this list, too? Yes! No matter if he's played by Glenn Daniel Nilsson or Tomi Metsäketo, ÅST's Marius is the most adorable, dorky thing I've ever seen in the role (meaning that in a positive way, so Nick Jonas haters may hold their peace)! Even with him hugging Éponine all the time, which I mentioned in the previous post... I just love him. Adorable awkwardness is not everything there is to Marius here, though. I love his more serious moments just as much as the adorkable courting Cosette scenes. From falling from a tree into Cosette's garden (never gets old!) to the way he shakes a fellow revolutionary's hand off his shoulders after Éponine has died... I love this version of Marius the best out of all the ones I've seen. I guess I've mentioned how much I adore the decision of including Javert in the Finale for about seventeen times already, so I don't really need to go into much detail... Let's just say, one time more, that for once my favourite character gets the ending he deserves. What I haven't talked about so much, yet (I think? ), is the staging of Javert's Suicide. I do like the traditional West End version, but the very end... The actor rolling around the stage like a dying fly really takes something away from the drama of the moment. Luckily that's not the case here. Instead, Javert falls backwards from a bridge and disappears. Boom, gone. Not a moment of awkward dying on the stage floor - and thank goodness for that. The impact is much stronger this way. The ABC Café is filled with brilliance. I don't try to claim the original staging isn't interesting, energetic and all that, but this... From the blood oath Les Amis take for the revolution to the mock fight Marius and Grantaire have after the latter has teased the former about Cosette... The less-than-gentle way Enjolras puts a stop to the aforementioned fight... The energy. I'm especially fond of the mock fight. I admit I don't remember, clearly, the details of that moment in the original, but I think I can still say I prefer this treatment. It's such a fun, nice moment this group of friends share - only to be interrupted by a higher call. Maybe my number one favourite moment of the whole show, if it's possible to pin one down. Simply the fact that the barricade has both sides has charmed me ever since the first time I saw this production. In the original, we don't see who the barricade boys are fighting against. We hear a disembodied voice calling them names every now and then, and then some lights to signify the gunfire. The revolutionaries die as heroes, the opposing side staying faceless, emotionless, monstrous. But here? We see the National Guard shooting the revolutionaries. And guess what? They're just as young, just as cute as the barricade boys. And they die, too. They, too, are fighting for what they believe to be right, and dying for their cause. I love the staging because it shows us all this and makes us think. The barricade boys aren't heroic martyrs anymore, and the whole second act seems much more realistic. Also, after the barricade has fallen, the bodies of both sides stay onstage for a surprisingly long time: all the way from The Final Battle to Turning. Thénardier robs them during his song. Then the ensemble ladies, giving a purpose for their usually very tedious number at long last, carefully take them all, both National Guard and Les Amis, away and clear the barricade. 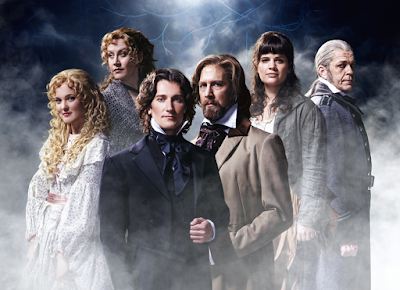 So, I saw Les Misérables in Åbo Svenska Teater again a little over a week ago, after a five-month break. As everyone who knows me in the least is aware of, Les Misérables is my favourite among all musicals, and ÅST's Les Mis is my favourite among all productions. Naturally, I'm very sad to know it's closing the next month, and "beyond excited" is a quite mild way of telling what I felt when I was back in the theatre. "Having a full-blown mental breakdown at the theatre foyer simply because of hearing a faint rehearsal of One Day More echoing from the stage" is a bit more accurate... Luckily, all my waiting paid off. The show was, if possible, better than I remembered, and I hold on to what I've said earlier: there's so much energy here, and the energy is what makes this so good. You can see every last member of the ensemble is giving their best, there's not a single weak link in the cast. Not to mention I've received an incredible offer... I've screamed about it to enough people already, so I don't want to say too much here, but if everything goes well... It may be the subject of my most amazing blog entry ever. You'll probably hear more about this in a week's time. That being said, today I'm going to ruthlessly dissect everything that's wrong about the ÅST production. Yes, I'll first be the first one to admit there's not much to complain about. I'm a fan of Victor Hugo's novel, but I still honestly think a stage production of Les Mis can work perfectly fine without being a carbon copy of it. Therefore won't rage about every little detail that's different from the book. In general, I'm really open to different interpretations. And, the overall quality being so good, I'm afraid I'll start nitpicking right away. That said, maybe still you're curious to know which parts I love the least? My number one complaint is the characterisation of Grantaire. Don't get me wrong. For the most part, Tore Norrby does a brilliant job as Grantaire - in my opinion, he has a voice too good for such a minor role! But the direction of this production makes Grantaire's character a confusing one. In the musical, Grantaire is still a drunk - "Grantaire, put the bottle down!" - and still a sceptic. His part in Drink With Me, the song dedicated to the everlasting friendship between the young revolutionaries, speaks volumes: "Can it be you fear to die? Will the world remember you when you're gone, could it be your death means nothing at all? Is your life just one more lie?" Even though Grantaire has followed Enjolras to the barricade, in his mind the rebels are still "them", not "we". And, even though it's not mentioned in the musical's libretto, many productions include some elements of Grantaire and Enjolras's relationship from the book (one famous example begins at 6:30 at this link). Sadly, almost every opportunity of developing the interesting love/hate relationship between Grantaire and Enjolras is wasted. "Grantaire, put the bottle down!" flies past in The ABC Café, and good ol' R is the first one to take a blood oath for the revolution. He fights at the barricade. He's like a big brother to Gavroche (though that doesn't bother me) and crosses himself when the little revolutionary dies (this, then again, kind of faintly does). And then there's Drink With Me, or Drick med mig. Being a huge fan of a Swedish-speaking production, it's a bit ironic I'm not good at the language at all. I only understand basic things and speak and write on an even more basic level... But still, I'm quite certain the translation gives Grantaire lyrics like "will anyone notice that you're dead?" What annoys me is that no one seems to react to his words. Grantaire sings his part in a clearly non-introspective way, but Enjolras kind of almost approvingly glances at him and then everybody moves on with their lives. This one guy hates the revolution and tries his best to destroy the team spirit, but hey, who cares! Wine of friendship! Skål! Grantaire then dies next to Enjolras on the barricade. During The Finale, which in this version features the spirits of all the most important dead characters of the piece, R is the one student to return with Enjolras. The way I understand these decisions is that, in order to justify the student with the most lines after Enjolras returning in the end, they've tried to soften his character, to make him almost Enjolras's right hand. I think I can see where they're trying to go with this, but the few lines the character has, in my opinion, undermine the efforts. Keeping on the subject of the Finale, another thing I don't understand at all is placing the Thénardiers in the front row during the final reprise of Do You Hear the People Sing. I love, love, love that this production has Javert in the finale. As most Les Mis fans agree, Javert is not the villain of the piece and doesn't deserve to be treated like one, being excluded from the Finale's heavenly chorus. So, a standing ovation for the production for putting Javert there! But then thumbs down for mashing the Thénardiers in the same row. More importantly, though, they're the show's true villains - especially in ÅST, they're twice as vile as the West End Thénardiers I've seen! So why they get a spot among the heroes? I understand, the show's message being of forgiveness, that you don't want to exclude them from the Finale compeletely... But the front row placement doesn't feel right to me. What else, what else... You see, I'm already struggling! Well, Marius. I love Marius, he's actually one of my biggest favourite characters in Les Mis. But ÅST's Marius sometimes seems a little too dense. Again, don't get me wrong! Marius has been played by two brilliant actors, Glenn Daniel Nilsson and now Tomi Metsäketo, and both do the character great justice. The only nitpicky detail I somewhat dislike is how much he hugs Éponine, all the time. I mean, Marius is supposed to be blind, he's not supposed to see that Éponine loves him... But can anyone be that blind? He hugs Éponine more times than I had time to count (though, I admit, him lifting Éponine off the ground was pretty hilarious) and even gives her a kiss on the cheek at one point! That's not the way you treat a friend you're not romantically interested in, is that..? It seems a bit cruel. Beyond that, though, I've no complaints about ÅST's Marius. He's the most adorable, awkward creature ever, just the way I like to see him! All that said... Having seen the show again, I love it more than ever, and these little faults aren't really worth anything in the big picture. I'll mourn to see the production go. A movie fan has the movie forever, but the fans of live theatre have to learn to let go... Then again, the perishability is a part of the beauty. But at least two times more! Click the picture to actually see something. This is a one hundred percent honest account of what went down when I last went to the theatre, to see Tanz der Vampire in Seinäjoki again. Most of this applies to every time I see shows. I usually wear Converse All Stars for long walks and the moments the need to run arises, and I have drag all sorts of stuff, from school books to packed lunches, along in my backbag so the hours in train will be bearable. Maybe going to theatre is a glamorous, special moment for some people - to me, it's special for sure, but in a way similar to extreme sports. Theatres, why are you so far away from me? The watermark is referring to my deviantART gallery, by the way. Like musicals, drawing is a dear hobby of mine - so of course some of my drawings are theatre-related. Check the link out if interested!